We’re a fun loving couple with a cat and a passion for travel, adventure, and making new friends as we go. WanderLounge is our second bus project. Our first bus was a shortie that we built in a hurry and took around the US over a 10 month journey… We crossed 27 states and saw amazing sights and met amazing people. This time, we’re going to take our time building an amazing bus and document it as we go. We’re big on DIY and saving both time and money where it’s reasonable to do so, you might find that our bus is a lot different than most. 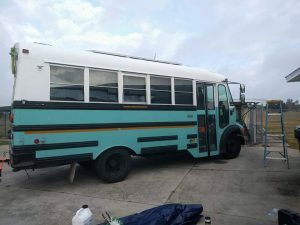 As I write this we’ve only just bought this new bus and are starting at Step 1, join us as we create something beautiful!